Sarah Jane Morris was spectacular yesterday evening in Morbegno!!!! Watching Sarah Jane Morris performing, one becomes fully aware you are in the presence of a very special artist and performer, a rarerity these days! Reduslim - Gewicht Verlieren: Effektiv, Richtig Und Ohne Diäten Reduslim - Was ist das? Bewertungen 2019. Preis. Wo kaufen in Deutschland? Kapseln zum Abnehmen Reduslim - Preise, Bewertungen, Beschreibungen, Kaufen Reduslim - Preparato naturale unico per un efficace dimagrimento senza danni per l'organismo Reduslim - Che cosa è questo? Recensioni 2019. Prezzo. Dove acquistare in Italia? Capsule Dimagranti Reduslim - prezzi, recensioni, descrizioni, acquista Reduslim para adelgazar - ayuda a reducir el peso de la manera correcta y segura Reduslim - Que es? Opiniones 2019. Precio. ¿Dónde comprar en España? Saw you at the Purcell room last night. Can't wait to hear the whole album. You are such a superb performer. Recent Blog: Driving Laws Regarding Cannabis Legalization in Canada . Hallo Sarah ,i never heard you before ,tonight it was for the first time afterthe rewind with Jimmy . I was the video and haard your voice ,wauw great . I will dry to fellow your music,as i do with Jimmys music. Thank you for your beautiful sound . Excellent web site. Plenty of useful information here. I'm sending it to a few pals ans also sharing in delicious. And certainly, thanks on your sweat! What a wonderful concert last night at 229. I was again enthralled by the passion and power of your singing, having first seen you with Antonio in Colchester in March, I have become hooked on your vibrant sounds and Passionate messages in your music. Accompanied by such talent you captivated the audience. Thank you! Big thanks to you and Antonio for the wonderful, sometimes fun, sometimes deeply moving music this evening at Colchester arts centre. Thank you too for your efforts for others and hope that the sleeping bag project is well supported. What a fantastic evening enjoying such beautiful music with Sarah and Antonio at the Astor Theatre. How inspiring and powerful the songs, brilliantly complimented by Antonio's profound guitar playing. Pure delight. An uplifting experience. Looking forward to seeing you both again. Peace and Love, Bob and friends. PS Enjoying your fabulous cd! Thank you for a fabulous evening last night at the Astor Theatre, Deal. It was a real privilege to watch such talented artists as yourself and Antonio. Really looking forward to seeing you both again. I've seen you with Antonio Forcione at Brasserie Zedel, such a beautiful performance! Looking forward to your next live acts. We went from oversea (Normandy) to see you at Ropetackle center in May. We enjoyed it so much. I was waiting since so long to see you live! Quand venez vous chanter chez nous ? Anyway we will come back as soon as possible ! Wonderful night at The Kino Teatr, St. Leonards-on-sea. Fantastic music in a great venue. Hope to see you back in St.Leonards soon. What an amazing night at Ronnie Scott's last night, even the sound problems didn't put a dampner on the performance. I have been following your career since 1986 and try to see you in concert whenever you gig at Ronnie Scott' or the Vortex.I can honestly say I have never seen a bad performance and always enjoy that amazing voice of yours.When is your new album being released? Thanks for a great evening and I see you very soon i'm sure and I can't wait. 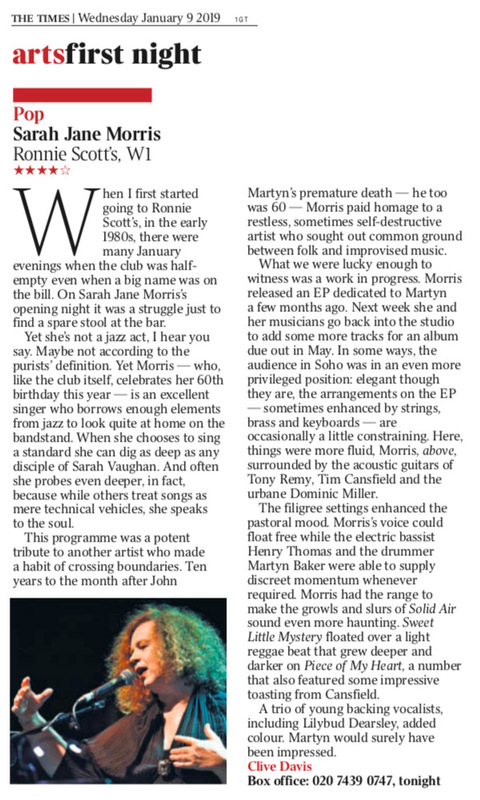 Saw the wonderful Sarah Jane Morris at the 606 Jazz club Chelsea on Thursday 4th Feb 2016, and my, my, my wasn't she unforgettable. That husky, soulful voice can't help but capture you and propel you into a place you want to stay forever. Her tone is unmistakable and I cannot wait to see her again. Thank you for your contribution to a making this world a much more beautiful place Sarah. Quisiera saber cuando planeas venir a Marbella, Andalucia. Thanks so much Sarah for an unforgettable night in Pescara. You put so much love into your songs and your concerts are enthralling. I love your stunning voice...gives emotions that no others can give! And we very much look forward to working with you again in the near future. Many thanks Sarah, Tony & Tim for a truly awesome (in every sense of the word) gig at Manchester's "Band on the Wall" last night - can't think of a better way to start 2015! Looking forward to listening to "Bloody Rain" which I bought last night! Please come back soon - and often!! All the best for 2015 - hope it's a good year for you all! I just wanted to tell you that my mum and I had a great time at The Auditorium in Rome. You are truly a gift from God! I thought you looked absolutely beautiful on stage, very relaxed and totally in command of yourself and your group. Thank you for taking the time to talk with me after the show! Thank you for the autograph! Thank you for the lovely picture! Thank you for all the joy and healing you bring! I was very moved by your performance at the Venus Nights show and your poetry really stuck with me. I'm at a point in my own trajectory where the dawning realisation of the silencing of women's voices through time and space is falling on me like a ton of bricks, and seeing you perform made me realise even more how we lack the right balance of voices in our culture. I think it's critical that you keep shining your light and I'm a huge new fan. As a guitarist I also really enjoyed Jennifer's work. I'm learning a couple of Rosetta Tharpe songs and I realised there are no transcriptions and none of her arrangements online, although plenty of tabs for arrangements of same songs by male peers. Perhaps I'll find a way to correct that. Anyway-Thank you. I am in Scotland for your upcoming event at Hippodrome London but I will tell all my friends to go! Bloody Rain at RonnieScotts on 4/1/14 was Sublime, sensational, exciting and very enjoyable! Good luck with the pledges, cant wait to get the album. Great gig last night at Hippodrome, it was a sheer delight. Loved the songs new and old and the band. As ever you move the body'n' brain and touch the heart. Been at least 10 years since we've seen you, far too long. First time seeing you in London, previously always been 'in da sticks' - Hemel, St. Albans and Bourges (Fr). Ended up spending a large part of this afternoon catching up on YouTube with some of your vids. My only slight reservation with last night was the venue, which I didn't share your enthusiasm for. Agreed the sound was good, also the staff were really friendly and helpful but afraid the casino venue especially having to leave through it, somehow took away from the experience and erased some of the great vibe from the music. I'm no prude about gambling, just it didn't somehow sit easily with some of the social content of the songs. Ok my problem not yours. As much as we want you to ourselves - you absolutely deserve a wider audience. I've no sense of what it's like for you to get gigs and venues - but I wonder was the only promotion via London Jazz Fest & next to nothing from the venue. I'm really blown away by the new design of your website, Sarah-Jane, and bouncing happily about the fact that you are doing Ronnie Scott's again next January. I'm sending you a huge bag of good wishes, may the new site boost your career and give you many gorgeous occasions to do your intense and wonderful work.